Big Pharma is licking its lips at the prospect of cashing in on a second round of the swine flu epidemic, despite the fact that the first outbreak of the virus in 2009 was proven to be a contrived hoax perpetrated by pharmaceutical companies in concert with the World Health Organization (WHO). governments were “threatened” by special interest groups within the pharmaceutical industry as well as the WHO to buy the vaccines and inject their populations without any reasonable scientific reason for doing so. “This was the mildest flu ever and the people were much more clever than the government so we have to find out what was going on with WHO - why did they do this pandemic alarm,” asked Wodarg, noting that pharmaceutical interests within the World Health Organization were instrumental in creating the panic and reaping the financial dividends. He also explained how health authorities were “already waiting for something to happen” (below Additional Information) before the pandemic started and then exploited the virus for their own purposes. Recent discovery of several dead migratory birds in Japan has raised concerns about H5NI avian influenza, avian experts said. of the fish are believed to have died in Chesapeake Bay. Scientists blame the frigid water temperature. 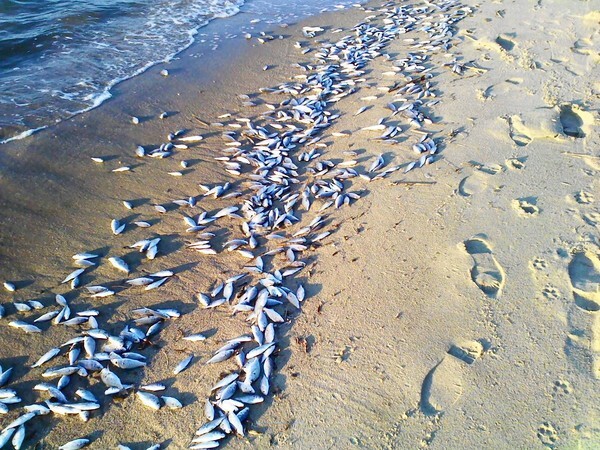 The troubling fish kill, coming as it did on top of reports of birds in Arkansas and Louisiana falling from the sky en masse, had some scratching their heads. "Is American Wildlife Cursed?" AOL asked in a headline over a story that began, "Maybe it's time to start storing those emergency food rations." Conspiracy theories raged on blogs, Facebook and Twitter. "So they['re] blaming dead birds on loud noises and dead fish on the water being too cold.... Are we supposed to believe that?!?" "Between all these dead birds and fish around the USA, I think 2012 may be it after all, drink up gang." Though officials in Maryland immediately explained what caused the deaths of millions of spot and croaker, people weren't willing to buy "cold-water stress" - not with so much other environmental upheaval underway. Alfred Hitchcock might have envied the austere shots of horror captured on film - all those still birds lying on highways, sidewalks and the brown grass of winter lawns. The cause of their deaths only deepened people's unease: blunt-force trauma. Then, a couple of days later in Louisiana, hundreds more birds - blackbirds, starlings, brown-headed cowbirds and grackles - expired in a similarly bizarre fashion. George Washington University religion professor Paul Duff, who has studied the Book of Revelation and the apocalypse, didn't seem particularly alarmed about all this when reached for comment Wednesday. In fact, he wasn't even gathering food rations; he was catching up on work in his office.